The “Statenjacht,” is a model of a Dutch State Yacht built by Dutch artist, Henny Fransen. from Hoorn, Holland. It is a beautiful model with amazing detail and accuracy, and that in and of itself makes it worthy for inclusion in the “Featured” area. But it is a very challenging and unique feature in the construction of the bottle that warrants this article – the ship is suspended in the bottle. 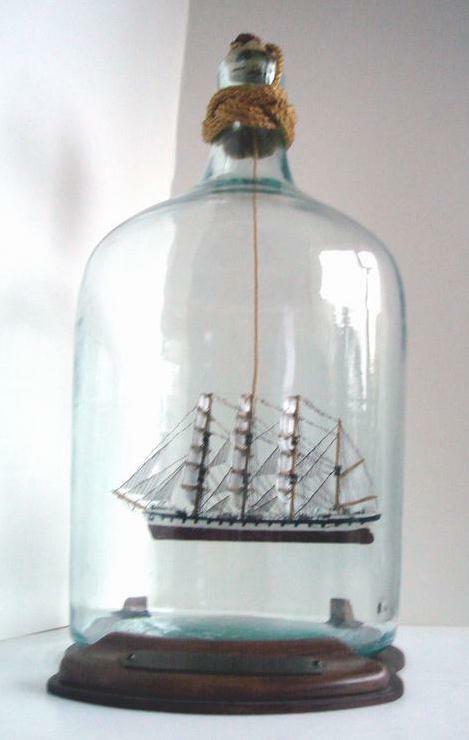 Virtually all ships, folk art, and whimsy built in bottles are found secured or mounted on the bottom of the container. Whether “sailing” on a sea of putty or glued to the glass, the models are secured in an effort to ensure that they will stay secure and together and will last over time. There are models where you will find the object mounted toward the middle of the bottle rather than on the bottom. Common examples of this technique are found in the ships made by the “Soldier’s Home” artists. The ends of the ship are glued to the sides of the bottle. This creates a very small contact area and for this reason it is not that uncommon to find bottles where the ship has come unglued and is loose in the bottle. Another variation is a plank or support spanning the sides of the glass of a bottle or a light bulb with the hip mounted to the plank. The type of suspended models considered here are the ones where the ship, folk art or whimsy hangs freely in the bottle from a string, wire, stick or some other hanging device that supports the object in mid-air. This is what you will find in the recent work of artist Henny Fransen in his model of the “Statenjacht.” His Dutch State Yacht hangs from threads (rope) used in a unique block and tackle rigging that comes down from a turned wooden stopper. The effect is wonderful! The ship “floats” in the middle of the bottle and can be clearly viewed from any direction. This is a very difficult procedure and extremely hard to get the ship balanced in the bottle since the suspension must be accomplished as a bottle is being sealed with the stopper. 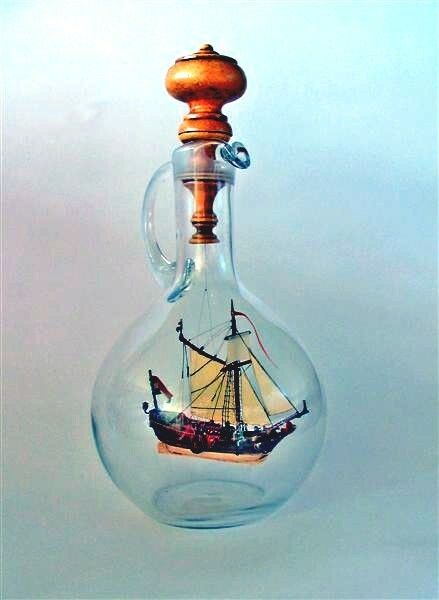 Another example and style of suspending a ship in a bottle can be found in a bottle made by a friend of Henny Fransen, and a fellow Dutch artist, Frans Dekker, who modeled a ship leaving the main mast extending all the way through the opening of the bottle enabling the ship to be suspended by this wooden mast. A wonderful example of a online slots suspended object that can found in the whimsy category is a thread winder built in a round flask-like blown bottle from the Meiji Era (1868 - 1912). It is a thread winder built in a round flask-like blown bottle. The winder hangs from two threads that go through a ball that is at the inside opening of the bottle. There is also a carved chain and ball in cage whimsy built in an old decanter. The bottom of the whimsy is carved in a cone shape approximately 4" long and is suspended approximately 3/4" from the bottom of the bottle. This whimsy is carved from the same piece of wood that includes the suspended part inside the bottle along with the ball and cage stopper outside the bottle. The wooden stopper has a cross arm made from wood and painted gold that makes the stopper impossible to pull out of the bottle. While suspended models are not commonly built because of the difficulty involved, it is also obvious that in most instances, a suspended ship or other object built in a bottle is also capable of swinging freely and as a result is subject to damage. This is likely a main reason why many builders would not consider this technique viable for their creation. But it is also a reason why the builder or collector of a suspended model in great condition would treasure the model and display it with great pride.